"Specializing in High-End Luxury Watch Repair"
Swiss Lever Watch Services has been established to provide exceptional personal service for your high-grade timepiece. Also with over 25 years of experience in the industry, Swiss Lever Watch Services provides a high level of expertise and craftsmanship. Through a combination of personal service, skill and integrity, you can be assured that your treasured timepiece is in good hands. An expert in watch repair, Joseph is a graduate of the Watchmakers of Switzerland Training and Education Program, and holds the CW21 certification from AWCI. He has extensive experience with high-grade luxury Swiss and American watches including Patek Philippe, Rolex, Omega, Hamilton, Waltham and more. 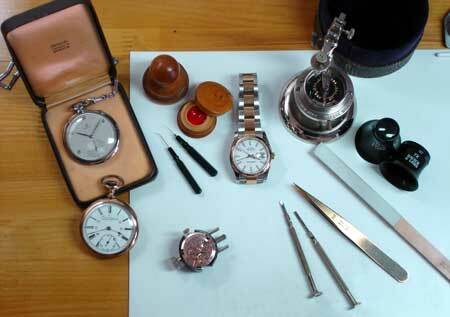 Click here to learn more about the Watchmaker behind Swiss Lever Watch Repair Service. Joseph Herold is CW21 Certified by the AWCI. Certification from AWCI means that a watch maker or clock maker has proven to a board of professionals that he or she has the skills to perform quality repairs on the materials for which they are certified. Click here to learn more about the AWCI.